Bullet Review:What do I write at the end of this fantastic trilogy? This was pure enjoyment, from page 1 of “The Hippopotamus Marsh” to page 562 of “The Horus Road”.Now that it’s done, I’m kinda sad to leave behind all these characters and not be a part of their world anymore.Full Review:I won't go into much of a plot synopsis as that would easily blow most of the spoilers from "The Oasis", but this is the conclusion of the conflict between Seqenenra, the rightful ruler of Egypt, and Apepa, the Setiu usurper, started all the way back in "The Hippopotamus Marsh".As I turned the last page, read the last word and found out what happened to my characters, the only thing that was in my mind was how bittersweet the whole ending was. It reminds me of the classic Star Wars trilogy of my youth - "A New Hope" was the inciting incident, the introduction of our characters; "Empire Strikes Back" saw our character endure many hardships and setbacks and "Return of the Jedi" saw evil defeated, but also the end (at the time) of the adventures of our friends and companions. In the same manner, "The Horus Road" is sad to me - I'm not going to be a part of Ahmose or Ramose or Aahmes-Nefertari or Tetisheri or Aahotep or any of the amazing characters that I've grown to love over this brilliant trilogy.This trilogy means a lot to me; I read this alongside my dear friend, Iset, who gave me the books some years ago. But more than that, these books have been the only 5-star rated fiction books I've read in some 3 years. I've spent many years agonizing over whether I even love to read anymore, if maybe reading has just passed me by, that I'm too cynical, too pessimistic, not imaginative enough to enjoy being transported away to another world. (Alternatively, maybe all the books being written these days were crap...)This trilogy made me fall in love with reading again. I'm stunned that I've read nearly 1800 pages of these books, as this is the one case where I look back at the pages I've finished and instead of going, "What HAPPENED in all those pages?" I went, "OMG, I read THAT much?! That much happened?! ""Lords of the Two Lands" is a beautiful trilogy, a real stellar example of how to do a trilogy well. I cannot heap enough compliments upon it - the characters are intricate and real, the setting is so vibrant and vivid, I feel as if I am living in Egypt, the story is complex, the writing is beautiful and elegant, yet not so heaped in purple prose as to obstruct the reading experience.I am so glad to end this year on this trilogy. 2017 was a tumultuous year in many ways, but in my personal life and in my reading life, it was pretty damned stellar. In the final installment to Gedge’s Lords of the Two Lands trilogy, the story of the Tao’s family attempt to reclaim Egypt from the Setiu invaders reaches a thrilling and riveting climax. I can’t say it’s the best book of the trilogy (deciding that would be something of a Sophie’s Choice), but I can say it’s a wonderfully written, compulsively readable finale.Ahmose Tao, Prince of Weset and self-proclaimed pharaoh now that both his father, Seqenenra, and brother, Kamose, have both died at the hands of those who claimed to be loyal yet ultimately betrayed them, has successfully reclaimed the entire land of Egypt. The last bastion of Setiu rule is their capital city, Het-Uart, a thickly walled repository of Setiu troops and scared citizens. Those impassable walls also held Ahmose’s sister, Tani, Apepa’s hostage these many years, as well as the physical symbols of Egypt’s divinity, the Horus throne, the double crown, the Crook of Mercy and the Flail of Justice. During the long months away from Weset, while Ahmose continues to lay siege to Het-Uart and finish the reclamation of his beloved country, a new center of Egyptian administration is taking shape under the capable hands of Ahmose’s wife Aahmes-nefertari and his mother Aahotep in Weset, both of whom effectively keep Egypt running by organizing and supervising the many small details required to keep a country working. Yet there’s a distance between Ahmose and Aahmes-nefertari which has nothing to do with their physical separation and as Het-Uart finally falls and a final betrayal to Ahmose’s reign comes to light, engineered by Apepa and orchestrated by Tani, Ahmose must decide if seeking reparation for such a awesome treachery is worth the price: the loss of his marriage and love of Aahmes-nefertariAs with the other books, the battle scenes are the poorest part of the novel, suffering from a lack of dynamism as the writing itself remains adroit. The only exception were the scenes describing the sieging of Het-Uart and, later, the Rethennu fortress of Sharuhen, which, perhaps because they were so much more intimate than the other large battle scenes, seemed to have a greater sense of urgency and were infused with a more authentic sense of the chaos which would surround such close-quarters fighting. Where Gedge really shines is in the complex interplay of her characters and their very human reactions and emotions. We see the fragility of Aahmes-nefertari as she tries bring together a nation in her husband’s absence while dealing with the trauma of childbirth and infant mortality; the desperation of Ramose as he attempts to rescue Tani, his idealized love; the cutting-to-the-quick of both Ramose and Ahmose as Tani reveals how she’s changed from the free-spirited girl they both knew years ago. Towards the end of the novel, these full-developed relationships intertwine to create a heartbreaking resolution of the story. That's said, Tani’s story is the most engrossing and the one which is the most vexatious. (view spoiler)[When we finally meet her after being closeted away by Apepa’s side for so many years, we see that she’s no longer Egyptian, but has adopted Setiu manners, to the point of even changing her name to Tautha. Her excuse? She was so long with Apepa, frightened and alone, missing her family, sure that Apepa would execute her for her family’s actions, but instead Apepa treated her with kindness and consideration. Soon she fell in love with him and consented to marry him. So that when Het-Uart finally falls and Egypt is free, she refuses to go home with Ahmose, instead holding fast to her marriage vows and claiming that her duty lies with her husband, Apepa and choosing the people of her husband over her own family. This sort of betrayal and cowardly behavior is so upsetting and abhorrent, it made me agree with Ahmose when he tells her “My only regret is that Ramose did no strangle you when he saw what you had become.” I mean, she even demanded an Egyptian burial for Apepa, using her status as a princess of royal blood to blackmail Ahmose into complying. (hide spoiler)]My horror at Tani’s behavior equaled that of Ahmose’s.In the end, The Horus Road is a rousing, nail-biting, undeniably satisfactory ending to a trilogy of books which comprise just about some of the best ancient Egyptian historical fiction out there. I've done little but sit and read The Horus Road since finishing my review of The Oasis earlier today. I can and do read lengthy books incredibly quickly. Gedge's books are a rare thing – I find them incredibly readable, but with enough depth there to keep me interested and invested in the plot, but more importantly, the characters. I don't really know what else to say about The Horus Road. The strengths of the first two books continue here. The characterisations are still detailed and the stakes are still high. I liked the arc that Ahmose and Aahmes-Nefertari's relationship went through. I liked seeing Ahmose's struggle to be king, not just military commander. I loved that the ghosts of Seqenenra and Kamose still hovered over the story from beginning to end.I wouldn't have missed an afterward that explained the significance of the struggle of the Setiu/Hyksos on Egyptian history, and the fate of the characters. But it's not really needed. Above all else, with The Horus Road, Gedge's Lord of the Two Lands trilogy becomes the sweeping epic I felt it would be in The Hippopotamus Marsh. This review is for the whole trilogy:This fine set of historical novels covers the reclamation of Egypt from the Hyskos in the 1500s BCE, culminating in the establishment of the 18th dynasty by Ahmose I. I picked up these books because I didn't know much at all about ancient Egypt beyond the standard stuff I learned in high school. The trilogy proved to be extremely interesting. Gedge does a beautiful job of bringing ancient Egypt to life and creating extremely real and sympathetic characters from such remote historical figures. I especially enjoyed her warm portrayal of family life. Gedge also deftly explores the effects of a brutal war, constant danger of betrayal, and prolonged struggle on her characters and their relationships. The final installment of the series, and I couldn't put it down. Parts get a little slow, but they are necessary for the development of the story. I will definitely look for more Pauline Gedge after finishing these three. Like most good series, this one had the best of the whole story in it. This book had some wonderful surprises in it, it found me loving the developments the characters were making. The third book was my favorite. I finished it a 5 days and really enjoyed the finishing of the trilogy. She's a great author who uses as many true facts about the time period as possible. OMG, the best ending for this trilogy. I have felt that the author did justice on the life of Kamose and Ahmose, but I know she dedicated the trilogy to Kamose.However, I would really like that Tani was punished more severely or that she realized how stupid she was, and felt the weight of her shame, but it was not meant to be. She held steadfastly to her blind love to Apepa (Apepi).Lastly, where is the promised honor for Hor-Aha? It wasn't in the epilogue, he deserves it, because he worked hard for it.Overall, I like this book, even if there were stuff that were left hanging. Okay, we all know that Ahmose ends up liberating Egypt from the Hyksos. The appealing part of The Horus Road is the journey to victory, not so much the victory itself. Will Ahmose be able to continue on and finish what Seqenenra and Kamose died for? Of course he will, but nothing will ever be the same again in the Tao family.Ahmose is a three dimensional character, but after reading The Oasis, which is in Kamose’s perspective, he seems pale in comparison to his brother. Yet, throughout the novel, Ahmose steps into the large footprints left by his father and brother and eventually outshines both of them. Ahmose is a great character, but Pauline Gedge has not neglected secondary characters like the resourceful Ahmose-Nefertari or the tragic Ramose. She only gives us hints at the great woman Ahmose-Nefertari would become, but it is enough to make her steal every scene that she’s in.Since the end of the war is drawing near, the plot moves along at a fantastic pace that makes you never want to put this book down. Cities burn, kings run from danger and betrayal happens on both sides…what more could you ask for in the conclusion to this stunning trilogy? The ending is not a perfectly happy one, but it is satisfying and the characters stay true to themselves.I give this book 4/5 stars. A difficult book to assess. In terms of the overall plot - the struggle by a noble Egyptian family to evict the Setiu from their country - it's anti-climactic. The decisive struggles were won by the lords of Weset in the previous book. So Ahmose is doing little more besides marking time as he besieges Apepa in his last stronghold. In some senses, this novel is a very long long denouement. ***SPOILERS***So the drama is built around the royal family of Weset and how their lives have been shaped by the conflict. Ahmose is alienated from his grandmother. Ahmose and Aahmes-Nefertari's become estranged over his frequent absences from home life, though eventually they reconcile. And the family is shocked when they learn Tani is in love with and loyal to Apepa. I suppose the interpersonal drama of the family has been the heart of the story all along. But it's difficult to maintain tension in that story when the external struggle is more or less resolved.Gedge remains masterful in her prose, in her characterizations, and in her depiction of the habits, the beliefs, and the physical beauty of ancient Egypt. The dramatic arc of the series was unsatisfying, but it's never less than a pleasure to be transported to Gedge's world. I've just finished this trilogy- it came to a satisfying conclusion. Aside from King Tut and Queen Cleopatra, I really don't know much about Egyptian history. I do know the author, Pauline Gedge, is a celebrated and meticulous historical writer so I have little doubt that her re-telling of Kamose, Ahmose et. al is as close to reality as possible. Fans of George R. R. Martin know that no one character is safe and in this Lords of Egypt trilogy this too is the case. It follows an Egyptian royal family whose divine lineage was usurped by a foreigner who slowly and subtlety unseated them and became King of Egypt. This is the telling how a family, through sacrifice and belief in their gods overcame the foreign obstacle and returned power to the Egyptians. There was much military intrigue and heart break in these tomes. A great read for historical buffs. *Spoilers*Final in the Lords of the Three Lands trilogy, and I'm glad it's finally come to an end. The last of the Taos, Ahmose, finally unifies Egypt and drives out the Hykos usurper Apepi. Unfortunately he lost his sister in the process, she had become the wife of Apepi and fallen in love with him.The fall of the usurper is just that. A fall. Apepi falls, breaks his leg, the wound goes septic, and he dies. The end. A little bit of an ignoble end for a man who was such a power figure in the trilogy.But all in all I think it ended well. Not a series I would read again anytime soon, too dry for me, but otherwise good. 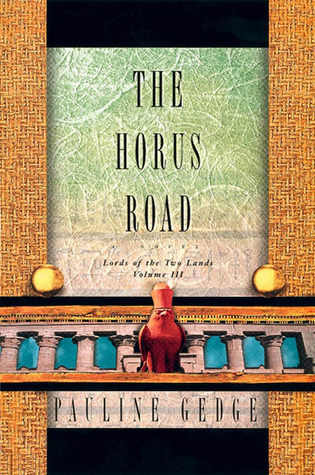 The Horus Road by Pauline Gedge was a joy to read. Gedge knows the exact recipe for historical fact and imaginative embellishment and creativity. The third of her Lords of the Two Lands Trilogy, this volume tells the story of second son, Ahmose, the third of the family to pick up the torch to secure Egypt's freedom from the Setui usurpers. A great story full of human drama, thrilling war situations and heart-wrenching tender moments, this is a great one. Yea for Gedge. This is a long book. And ultimately a DNF for me. It was well written and historically accurate, but I just wasn't in the mood for a saga. In all fairness to the author, though, I did not read the first two books in the trilogy. I hadn't realized that this was the last one, although that didn't prevent me from understanding what was going on. I really don't like trilogies... they force me to keep on reading to find out the ending. I find that parts get a little slow, but they are probably necessary for the development of the story. But this book was way too long. A stunning end to a thrilling trilogy. See my review of The Hippopotamus Marsh. Pauline Gedge does not disappoint! A wonderful ending to this great trilogy. I hated to see it end. I found this book to drag a little halfway through. The ending was good and finished off the trilogy. I have read ether books of around this time. I really enjoyed this trilogy and learning about Egypt.